Submitted by Joseph Melville... on November 27, 2010 - 2:10pm. 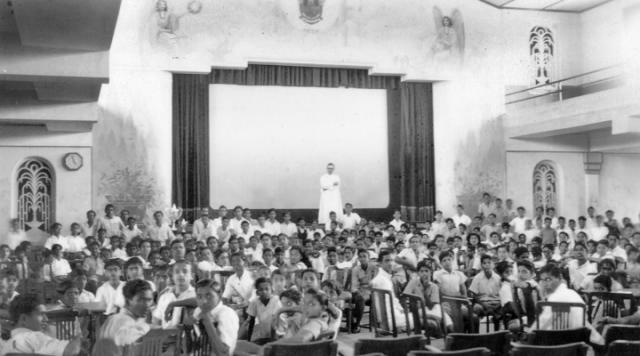 Famous for its "Movies" every week, I find myself in the School Hall, even today after 50 years, if I were to close my eyes and flash back to the days when I was ten years old. I was a boarder in St Stanislaus for only two years, during 1961-63 in the 6th and 7th standards, (so I belong to the "Batch of 1967"). As boarders, we went there more often. Fr. Casale was our principal. Mrs Philomena D'Souza (nee Valladares) taught me my first English in Std VII, after the lessons my mother learned me. I hope the excellent practice of showing movies to students in the Hall still continues today. The feature film used to be preceded by small documentaries.The visual power of those films is still with me. Maybe, at a sub-conscious level, these movies contributed to my taking up journalism as a career. Recently, when I went for the 75th alumni meet, which took place in the Hall, I was happy that many of the old iron chairs, fixed to the floor as in the old talkies, were still around. I hear St Stanislaus is completing 150 years in 2013. If a book is published on the occasion, I hope there are some pieces on the School Hall. Submitted by Arvind Rajashekar on December 6, 2009 - 12:41pm. Easily one of the best school auditoriums I have ever come across. There are many fond memories I can associate with it: The visual instruction periods 2 consecutive periods where we saw many interesting documentaries, thursday movies, the many talent contests and other events, the high quality of plays etc and finaly the farewell dinner for our batch on our last day as school boys. Submitted by cgomms on April 29, 2009 - 1:30am. The School hall brings back huge memories. I myself graduated in 1978. But have used the hall for a lot of other events after that.